The ongoing conflict in Yemen has imposed grievous costs on Yemenis, damaging lives, property and infrastructure and collapsing the country’s already fragile economy. And yet the conflict will eventually subside. Although some reconstruction projects have begun, they have generally been undertaken haphazardly and not as part of a comprehensive and structured plan. Post-conflict reconstruction following the war must address the basic needs and rights of the Yemeni population and put the country on the path toward sustainable peace and development. This report examines the literature regarding post-conflict reconstruction and draws lessons from the reconstruction experiences of Afghanistan, Iraq, and Lebanon, in addition to multiple past post-crisis reconstruction efforts in Yemen itself. Past Yemeni efforts in the wake of disasters and conflicts have been ad hoc and reactive. The Yemeni government has demonstrated a limited capacity for aid absorption and weak capacity for project implementation. Donors have contributed to these poor results, to a certain extent, by circumventing the state and disbursing aid directly, thereby ensuring that the state do not develop the inherent authority to manage long-term reconstruction. Furthermore, actual donor disbursements often fail to keep pace with initial donor aid commitments. 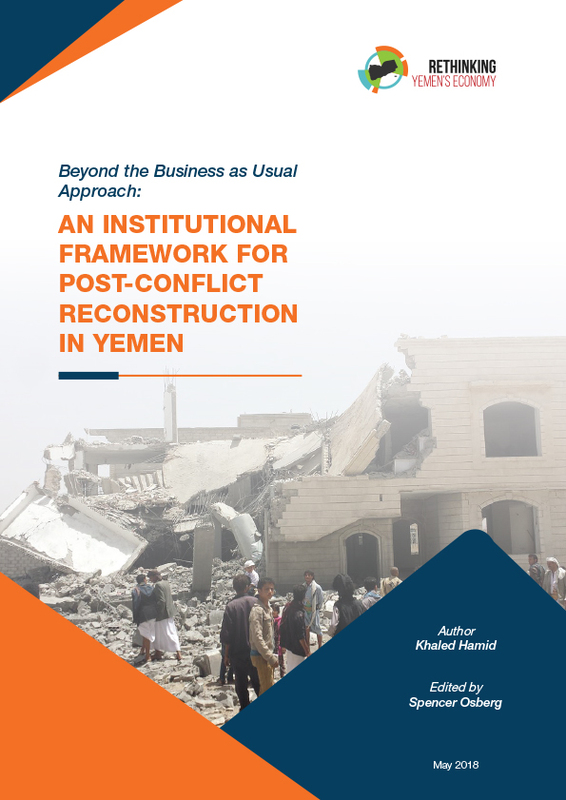 Drawing on lessons from past reconstruction efforts, this report proposes a new institutional structure for a proactive, permanent future reconstruction authority in Yemen. Because the war has both damaged the central government’s capacity to provide services and worsened regional and sectarian fragmentation, it is impractical to rely solely on the central government for post-conflict reconstruction throughout Yemen. Therefore, Yemen should adopt a multi-level mixed institutional approach to reconstruction that closely coordinates with all stakeholders. Yemen should proactively establish a permanent, independent, public reconstruction authority by presidential decree. The reconstruction authority should have a clear mandate to coordinate end-to-end post-conflict or post-disaster reconstruction efforts, including strategic planning and policy design; organising funding and fundraising; coordinating with the central and local authorities, international organisations, donors, and local stakeholders; implementation (through a competitive process that allows public sector units and private sector companies to compete in bidding); and conducting ongoing monitoring and evaluation for transparency and accountability. The reconstruction authority should have its own protocols for procurement, personnel, and payroll. The reconstruction authority must have the capacity to set up local reconstruction offices immediately following any disaster or end of conflict. These local offices will be fully empowered to manage projects of a certain scope within their areas of remit, including assessment, planning, local funding and fundraising, project implementation, monitoring, reporting, and coordination. The reconstruction authority must establish a clear framework for working with all stakeholders, including the coordination of long-term and strategic projects with the government of Yemen. The reconstruction authority should establish a pool fund for all donors, whether managed by the reconstruction authority itself or jointly co-managed by the reconstruction authority and an international or regional development bank acting as a trustee. The reconstruction authority should establish its own monitoring and evaluation unit in conjunction with pre-existing Yemeni government entities, using its own internal monitoring and evaluation system. The reconstruction authority’s board of directors should include: representatives from the donor community (both from within the Gulf Cooperation Council and from among international donors), representatives from the cabinet, and representation from the private sector, in addition to the executive director. The board should be chaired by a Deputy Prime Minister to ensure it has the highest level of support. The responsibilities of the board should be clearly stated in the decree establishing the bureau. These responsibilities should be limited to strategic-level direction and oversight, ensuring that the executive management of the reconstruction authority has the flexibility required to implement projects effectively. The reconstruction authority’s board of directors should follow a competitive, merit-based, transparent process for the recruitment of its executive director, the directors of local reconstruction offices, and all staff. The reconstruction authority should seek the involvement of Yemeni citizens and professionals across all economic sectors at the central and local levels to facilitate the technical reconstruction work.